Note: The information presented in this post can apply to any tweetchat - not just the #FLBlueChat. A tweet chat like the #FLBlueChat chat starting on February 11th at 12:00EST can be a great resource for obtaining useful information and tips about a specific topic. It’s also a great way to make new acquaintances, share your knowledge with others and establish your personal brand. 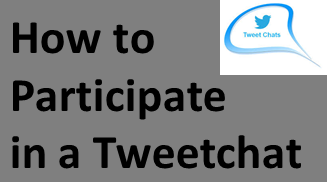 In advance of this new chat on the topic of the ICD-10 mandate, I wanted to share some information on participating in tweet chats and getting the most bang for your tweet chat buck. If available, review the chat questions prior to the event. Tweetchat hosts often post chat topics on a blog or other page on their website. If time allows, spend a little time ideating your contributions and questions prior to the post. You can also follow a hashtag in a Twitter client like Tweetdeck or Hootsuite. Just set up a search for the #FLBlueChat Hashtag and all of the tweets with that Hashtag should show up in the search window. Prior to the start of the chat, you may want to RT the host’s tweet announcing the chat. This can also inform your followers that your Twitter stream may be overly active for a short period of time - assuming you plan to share a lot. As the old saw goes about God giving us two ears and one mouth, consider using two monitors to be able to read tweets on one monitor while typing tweets to share on another. I write my tweets in Word and then copy and paste them into the Twitter client. Note the type of information being shared and who’s doing the sharing. You can learn a lot this way. 2. Introduce yourself at the beginning of the chat. This is especially important if you’re a first-timer/relatively new or if you’re Tweeting as a brand. “Hey all, Steve here from suburb of Phoenix – healthcare payer IT guy”. Re-tweeting what others share is a common way to support statements from other tweet chat participants and share them with your own Twitter network. Hosts love questions. Sometimes even irrelevant questions because some hosts think EVERYTHING is related to their topic. It may be helpful to preface your tweet with “Question:” or "Q:"
3. Be sure to include the Hashtag in each of your tweets! Every tweet MUST have the designated hashtag in it or other participants will likely not see the tweet. If you ask a question or respond to someone in the chat, use the designated hashtag so others will see your tweet. Note the Twitter handles (account names) of those sharing interesting information, comments or perspective. You may want to consider following them or adding them to a list of those to observe for a while prior to following. It’s Not Over Until You Say It Is! When the chat ends, tweet a message of thanks to the host(s) and perhaps anyone who made the chat more worthwhile to you. If everything went well, you’ve made a new connection or two. Follow-up in the coming days with a friendly tweet. Continue the conversation that was started and begin to build out the new relationship. 3. Review the chat summary or transcript. Many hosts will post a transcript of the tweet chat. This is particularly helpful if the chat was fast moving. In many instances, you can also pull your own transcript. @Symplur is a free tool you can use to review transcripts and statistic summaries for tweet chats that have registered on the site. Also, @Storify is a tool used to create a transcript o a series of tweets and add some commentary and context to the chosen tweets. If someone has “Storified” the chat using @Storify, then check that out. Moreover, you can subscribe to stories and obtain new information that may be subsequently added. I hope the above information was helpful. 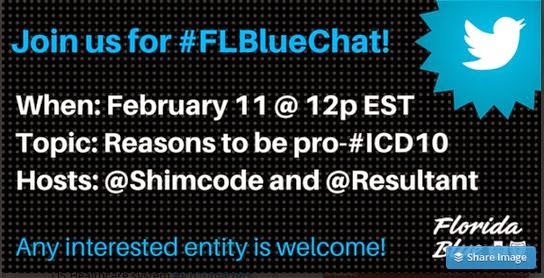 Why not come join the first of a series of #FLBlueChat chats on Wednesday, February 11th @ 12:00pm EST. Your blog is really awesome. i really like it.